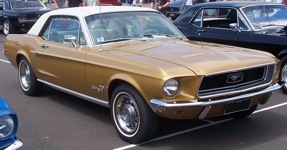 Four special order colors were offered as part of a 1968 national Color of the Month Mustang promotion, although it may have been up to participating dealerships to name the promotion and colors. The Color of the Month promotion offered a special ordered color and sport options for each of the first 4 months of 1968. Gold was offered in January for the New Years celebration; pink in February for Valentines Day; green in March for Saint Patrick's Day, and coral for Easter in April. The color names listed above are examples of names that a dealer could use. Here is an example invoice of a Passionate Pink 1968 February Color of the Month promotional Mustang. In this example, it appears that only the color was discounted as no charge (NC). 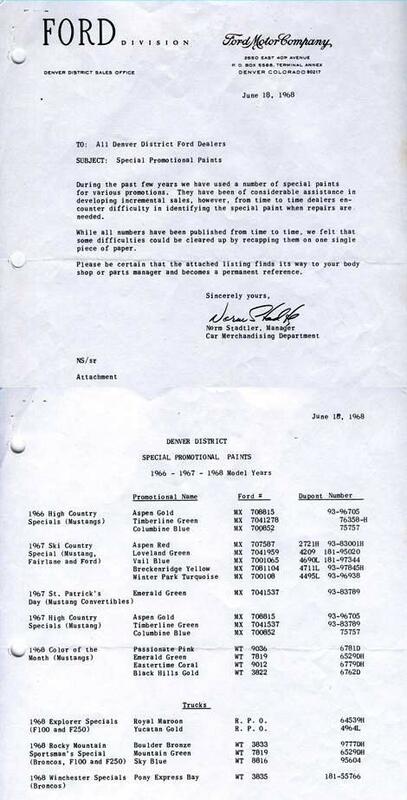 Below is part of a letter from Ford dated June 1968, that indicates the following 4 colors for the 1968 Color of the Month (Mustangs). The letter has a header indicating that the promotion might be only a Denver district area promotion but we have found cars painted these special colors ordered in Los Angeles and Newark which were built in San Jose (VIN staring with 8R) and Metuchen, New Jersey (VIN starting with 8T). For this reason, we believe the Color of the Month was a national promotion where Ford offered a color each month in the beginning of 68 at a special price, allowing the dealers to come up with their own sale and own paint names. This makes sense since we found specially gold painted Mustang promotions in January called the "Golden Mustang" and a "Special Dakota Days Gold Mustang", pink mustang specials in February, special green painted Mustang for a St Patrick's Day parade, and coral Mustangs in Colorado during April. This is a list of all 4 colors and the information we have found for them to date. Click on the color name to see examples of Mustangs we've collected. If you have more information please let us know. We've recently discovered that Emerald Green was available at least until 1988 as a special order fleet paint. We are still looking for examples of an Emerald Green Mustang, although we have found an Emerald Green Ford Bronco from the same time period. Ford Paint Numbers were typically assigned in order, starting at 0001 in the 1950's preceeded by a M2J. By 1968, the numbers were in the low 3000s preceded by the letter M and typically an A at the end for an exterior gloss finish. In 1977, they were up to the mid 5000s. It also appears that very early on Ford reserved some numbers for special order paints at first with 5 digit numbers and later, in the 1960's, with a series of 4 digit number preceded by the letters WT (non-standard special order paints having 5 digits and preceded by the letters MX). The special WT codes are divided up as follows WT0000s for whites, WT1000s for off whites, WT2000s for gray, WT3000s for brown and gold, WT4000s for red, WT5000s for orange, WT6000s for yellow, WT7000s for green, WT8000s for blue, and the WT9000s for purple maroon and pink. The metallic paints were 500 and above in each set. This special use of reserved color codes is still being used today. Ford Paint Number reuse is not that common. In most cases we see very old colors, such as Diamond Blue WT0921, don't change and is used a great number of years even though the Dupont formulation changes. We have been able to confirm that if a special order WT code paint is used as a standard offering for a year, then the 4 digit number does not typically change; just an M is added to the beginning and in most cases an A at the end. 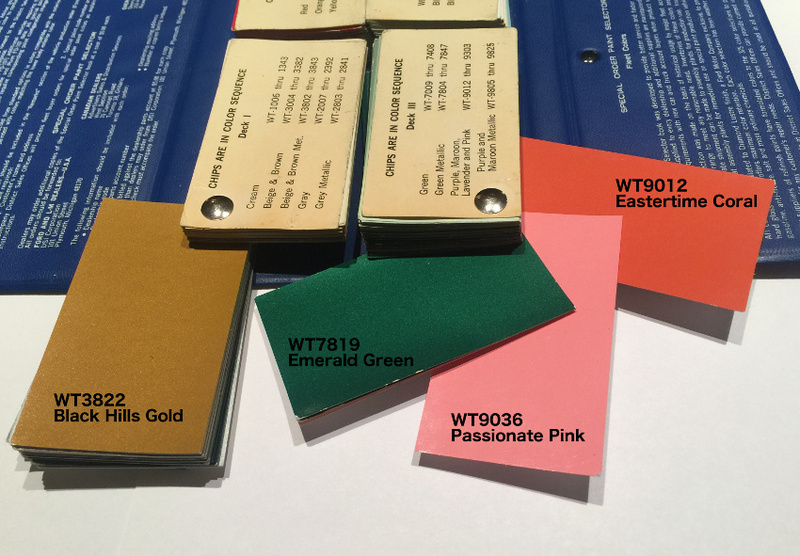 Below is a photo of the paint chips for all 4 colors. Only the Black Hills Gold and Emerald Green paints are metallic. Eastertime Coral is much more red than I would have originally expected, but I have ordered samples of the paint and it was also very red.